Trombone Shorty is actually sort of tall. And he's as likely to captivate with his trumpet as with his namesake instrument. But when Troy Andrews (his real name) was just 5 years old, already playing trombone in second-line parades in the Tremé neighborhood of New Orleans, his older brother James, a trumpeter of deep local influence and widespread renown, shouted out the nickname. It stuck. 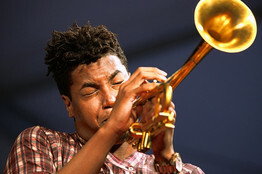 Christian Scott performing at the 2010 New Orleans Jazz & Heritage Festival.